A summary of each species/genus is accessible from the fact sheet index, or by clicking on the fact sheet icon next to the taxon name if you are in one of the keys. Key characters: summary of the key characters used to separate the genus from other genera. Number of species: the number of species recorded world-wide. Similar taxa: a list of genera that share key characters with the genus in question, with differences listed for separation. Distribution: general world-wide distribution, based mainly on published data. Hosts: a list of recorded host plants by common name and or species name where available, and family. 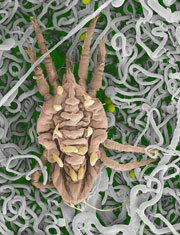 Colour: when available, information regarding the colour of the mites and their eggs when alive is provided. Remarks: some notes on general or remarkable features and biology, or taxonomic conundrums. Synonyms: a list of any published synonyms. Suspected synonyms: a list of species of questionable status, generally unpublished data based on examination of specimens and literature. Key characters: a summary of the characters used to separate the species in the genus. Distribution: the known distribution of the species, based on published records and interception data. Note that within the Brevipalpus californicus and B. phoenicis species groups, there are several distinct taxa listed as species A, B, C, etc. For these fact sheets, the distribution data are provided solely for specimen identifications confirmed by the authors. Hosts: a list of published and unpublished host plant data, listed by common name, species name where available, and family name. Note that within the Brevipalpus californicus and B. phoenicis species groups, there are several distinct taxa listed as species A, B, C, etc. For these fact sheets, the host plant data are provided solely for specimen identifications confirmed by the authors. Remarks: generally some notes on the known biology of the species or interesting taxonomic facts.